Automatically discover adjacent when a colony is built. For the region, see Russia (region). Russia does not exist at the beginning of the Grand Campaign; it is a formable country. Historically, the Tsardom of Russia was formed by the Grand Principality of Muscovy on 16 January 1547 when Ivan IV the Terrible crowned himself the "Tsar and Grand Duke of all Rus'", and Muscovy will usually form Russia in most campaigns. It is also possible (but more challenging) to form Russia as Novgorod and even more challenging to form it as Ryazan or Tver. Russia's primary strength lies in its lineup of geography, ideas, and abilities to create an unconquerable juggernaut when ruled by the player and an often formidable opponent when left to its own devices. duchy rank), of which it's an evolution. Only Russian principalities or Veche Republics will gain this government form upon forming the two aforementioned countries. −2 War exhaustion, raises 20% of forcelimit as streltsy units in the capital. A tsardom can claim an entire area owned by a country instead of individual provinces for just +50% the spy network cost. Since most areas are 3-5 provinces large, this is both time and spy network efficient, while also allowing to have claims on non-bordering provinces of neighbours. Russia can reach the Pacific Ocean fairly quickly. has not enacted the States General government reform. Russian Missions focus entirely on expansion of the motherland. Historical actions such as expansion into the Eastern Steppes, Colonization of Siberia, and capture of the "Window on the West" are encouraged by missions granting claims and modifiers upon completion. Russia's rich and interesting history is represented in game by several dynamic historical events including, most importantly, the Pomjestija Reform, Time of Troubles, the Grand Embassy, and even the rise of the Romanov Dynasty. Russia shares The Pomjestija Reform event with Muscovy, an event that grants reduced technology cost for 10 years. Russia runs the risk of running into their Time of Troubles at any point between 1550 and 1650 if its stability is below 0. This event series gives neighbours opportunities to back pretenders to the Russian throne, which will further extend Russia's internal chaos. 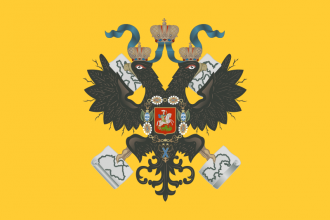 To bring an end to the Time of Troubles, Russia (or Muscovy) must not be at war, have a war exhaustion less than 3, no revolts going on, positive stability and not have the Usurper on the Throne modifier. Once all these conditions have been met, the mean time for the End of the Time of Troubles event to fire is 24 months. The Grand Embassy event is modelled after Peter the Great's accomplishments in the late 17th century. If Russia has not westernised, its monarch has good stats, and the date is late enough it is possible for the monarch to travel around Europe, learning various things for his country and increasing relations with neutral nations. As a more western oriented state, Russia must have their capital in the west, and St. Petersburg will be our glorious beacon! does not have Neva (33) as capital. does not have country flag relocated_capital_st_petersburg. has a core on Neva (33). ducats equal to 1 year's worth of income. 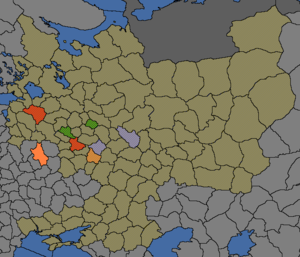 moves its capital to Neva (33). changes its name to St. Petersburg (with province capital St. Petersburg). culture to the culture of the former capital. Constantinople is no longer the bastion and defense of Christianity. We need to pick up the mantle and establish a third Rome. does not have country modifier “Russian Patriarchate”. does not have mission Russian Patriarchate. has a prestige of at least +2. has less than 3 innovative ideas. -20% cost of reducing war exhaustion. Have a good strategy for Russia? Yaroslavl) could also form Russia, but since these are extremely weak, this is very difficult.